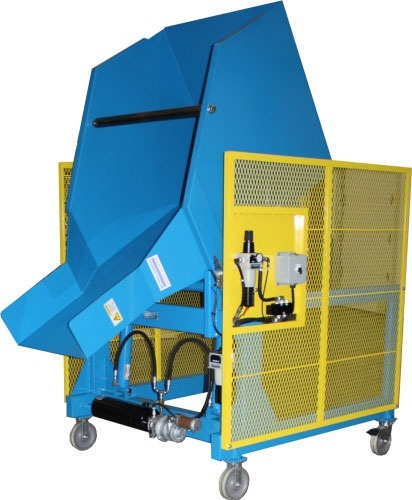 Heavy-duty tubular steel frame construction with continuous weld for extended equipment life. Loading skip is 42” wide x 48” deep with a 28” wide discharge opening. Unit has a 2,000# operational capacity. 33″ discharge height with 24” discharge projection. 45° discharge angle with 135° bucket rotation. Welds on interior of loading skip are ground smooth. Heavy duty retainer bar to prevent excessive movement of container during dump cycle. Dump carriage rotates on a 3” diameter pivot shaft with four (4) bolt piloted flange bearings. Containers are fork lift loaded at floor level. Unit features perforated metal guards on two (2) sides of the unit. Painted safety yellow. Unit is portable, movable design with four (4) – 8” heavy duty casters. Two include manual locks. Intrinsically safe operating system for Class I, Division I service. Unit includes intrinsically safe pneumatic directional valves. Hoffman NEMA 4 carbon steel enclosure with momentary pneumatic controls. 2 GPM hydraulic pump system with 3 gallon reservoir. Pumping unit driven by a 2 HP pneumatic motor. Air motor requires 70 CFM @ 70 psi.